It is dim, and there’s a sombre tone to the first of the three rooms of Jonas Staal’s The Scottish-European Parliament. Coming in, the European Union flag has a few dislocated shoulders, all in black and white like the rest of the room. Though pristinely printed, it’s looking skewiff, a little unfamiliar. Through this room, there are the variously charismatic tones of a series of different speakers. They speak earnestly and with the unpolished fluency of people who speak about politics a lot, but haven’t had media training. Their comments sound off the large star-shaped wooden sculptures in the room. Looking partially submerged, they are incomplete and lean around at different angles. Are they sinking or rising up? The artist structures the show around these large set pieces, and this very duality of crisis of Brexit and any potential opportunity for future better governance. 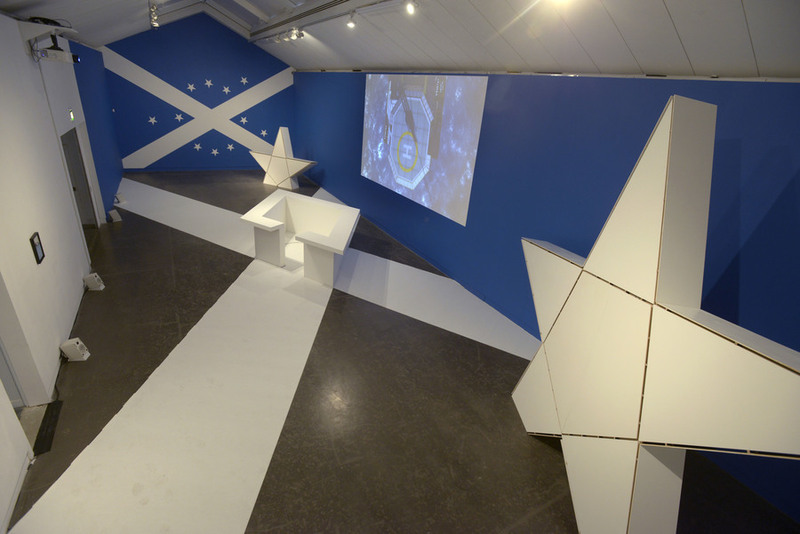 The idea of performance within politics features in the video in the large central space of the CCA gallery, which is itself dominated by the motif of the saltire crossed with the European stars, and a video of Staal's proposed Scottish-European Parliament to be built on a disused oil rig. 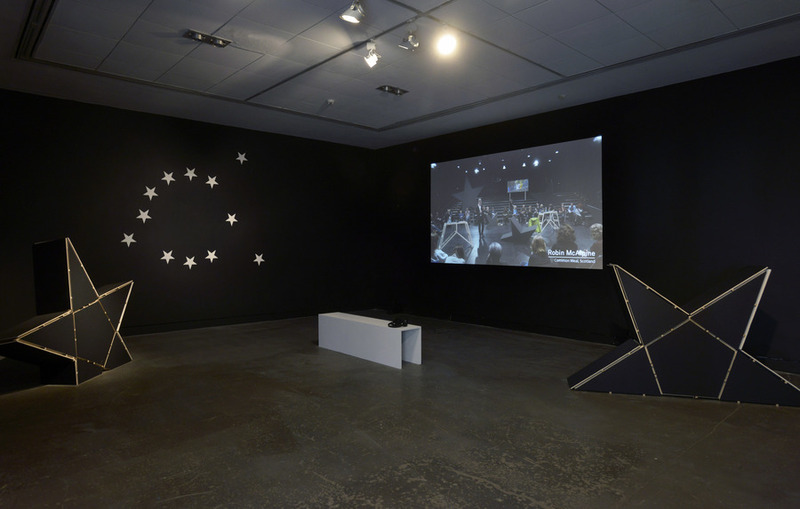 In the video, Staal himself gives a speech in the same room, and mentions the idea of the performativity of political assembly – parliaments, marches, occupation. 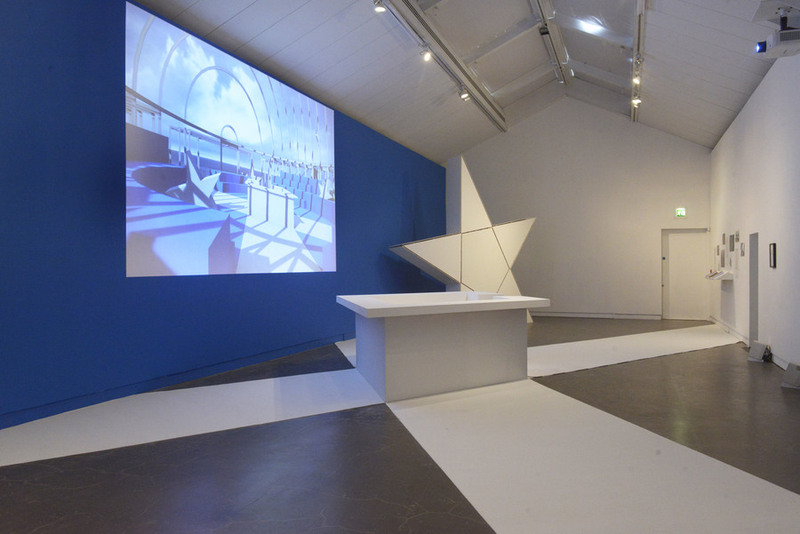 Staal's acknowledgment of the politics, potential and symbolism of the spatial design of the rooms in which political discourse takes place propels many of the proposals and sculptures around the exhibition. In the final room, there is further documentation of a conference-style meeting, and it’s clear that Jonas Staal’s exhibition doesn’t shy away from being dense, academic and sober. In the face of the current political climate of bipartisanship and the bellowing reactionarism of the right wing, an emphasis on considered discourse is a necessary counter to the punishing entertainment of Brextrump 2018.